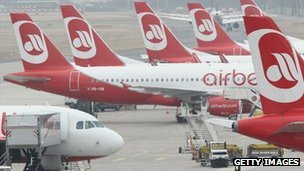 Germany's second largest airline, Air Berlin, has reported worse-than-expected losses for 2011 as it continues its efforts to downsize. The firm is 30%-owned by Abu Dhabi-based carrier Etihad. Air Berlin's revenues rose 13.7% to 4.23bn euros and the number of passengers rose by 1.2% to 35.3 million. "Despite record figures for turnover and passenger numbers, we cannot be satisfied with the 2011 results," said chief executive Hartmut Mehdorn. "Not only as a result of the severe winter in Europe in early 2011, the Arab Spring, air-traffic control strikes and the threat of strike action, the results remained well below expectations," he added. The company has called for the government to scrap a new air traffic control tax introduced in 2011. Mr Mehdorn argued the tax "leads to distortion of competition, is environmentally nonsensical and puts jobs at risk". The struggling carrier is in the middle of a efficiency drive designed to cut 200m euros from its costs in 2012. However, it said it would be hard to predict whether it would make a profit in 2012 due to the worsening economy. Following a rapid expansion, Air Berlin has failed to record an operating profit since 2007.